In order to find the right garage door opener for your home, you need to take several things into consideration. The main factor to consider is the drive system your new motor unit will use. There are three different types that are commonly used today, and each one of them has different benefits and downsides. Chain drive opener models are known for being very strong and reliable. The steel chain that these units use is quite similar to that of a bicycle, both in appearance and in how it works. The main benefit that this type of drive system offers, aside from the aforementioned ones, is the price. Chain drive models tend to be the cheapest of the three types. At the same time, units of this type tend to be noisy and require regular lubrication maintenance to keep working smoothly and to make less noise. Units of this type are similar to the previously mentioned chain drive ones, with one major difference. They use a belt instead of a chain. This part is usually made from steel-reinforced rubber or polyurethane. Belt drive openers are the least noisy ones, but that silence usually comes with a higher price tag. They also don't need to be lubricated, which is a plus in terms of maintenance, however, they also aren't as strong. This is also known as the screw drive. Units of this type are faster than the other two, and they require very little maintenance, aside from a little lubrication every once in a while. They fall in between the other two types when it comes to noise output and price range. Their main downside really is the fact that they can react to drastic temperature shifts. Traditionally, all openers used to be equipped with an AC motor. These motors offer dependable performance and tend to be quite durable. However, they are also very loud. 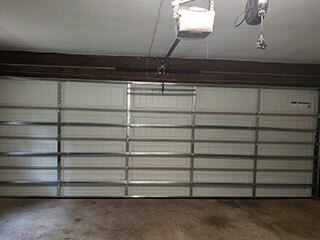 In the past several years manufacturers started introducing garage door openers that employ DC motors. These have a smoother start and stop action compared to their counterparts. This is a great advantage, especially when urgency is needed, like when you're in a hurry to get to work. DC motors are also less noisy, which makes them a fine choice for attached garages which are next to or under a bedroom. No matter which type of motor you choose, you have to ensure that it will have enough horsepower to lift your door along with the spring system. The horsepower must correspond to the door’s size and weight. If you're uncertain how much you need, or if you want some more advice and would like our experts to help you make this decision, all you need to do is give us a call.